Medium Brown natural hair colour that is chemical free, organic and not tested on animals – PETA certified. Balance and nourish your hair as you colour. 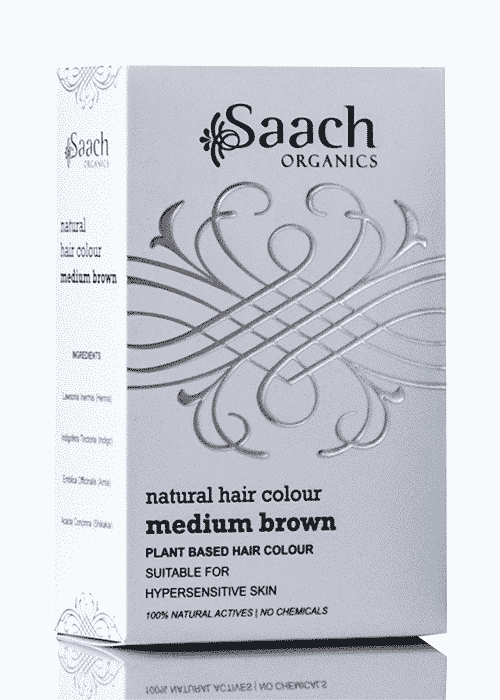 Saach Organics Medium Brown Natural Hair Colour is a semi-permanent hair colour derived from natural plants and minerals, making it a perfect blend of rare hair treatment herbs without any active chemicals. Semi–permanent medium brown natural hair colour treatment that lasts, whilst balancing and nourishing each and every hair, helping to prevent breakage and over-drying, leaving hair thick, lustrous and naturally healthy. 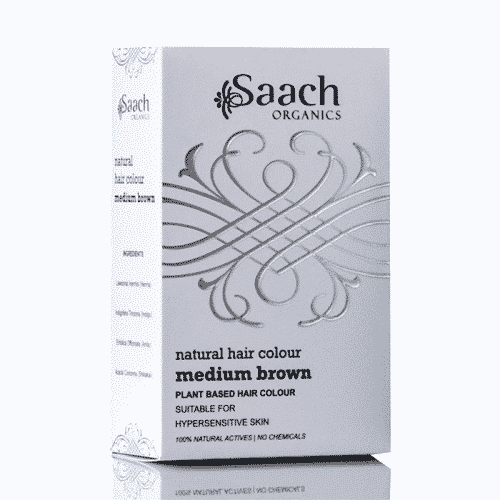 About: Saach Organics Hair Colours are semi-permanent hair dyes derived from natural plants and minerals, making it a perfect blend of rare hair treatment herbs without any active chemicals. Natural Hair Colours are the first semi–permanent hair colour treatments that last. They balance and nourish each and every hair as they colour to help prevent breakage and over-drying, leaving hair thick, lustrous and naturally healthy. Great product, will definitely buy again! Natural looking color unlike the red of other henna dyes I used. This is my favorite product! What’s not too love. Cruelty free. Great choice of colours. Conditioning. And does not make my sensitive scalp itch. I have been using henna based hair dyes for one year and I recently bought this hair colour from my local Herbalist’s to cover my greys. I am really impressed with the overall performance of this product. I used 100gr and added about 300ml of hot water to make a paste the consistency of thick Greek yogurt or porridge. The paste was very smooth and therefore easy to apply. I applied it to my roots first with the brush, working in sections and then I applied it to my lenghts with my hands. I left it on my hair for one hour and a half and I was really impressed with how it managed to blend away my greys in such a “short” time for henna (I usually let henna sit on my hair for at least 4 hours). My grey roots were covered in a slightly lighter colour (light coppery brown) than the rest of my hair (medium coppery brown). If I wanted my grey roots to look darker I would need to do a second application or maybe leave the henna on my hair for longer. In terms of coverage I guess it also depends on the structure of your hair, whether it is more or less porous for example, etc. I am very happy with the results and I will buy this dye again. Thank you, Alice, for your lovely review we are very happy that you’re happy! Thank you for your inquiry, yes we have many customers that are men .